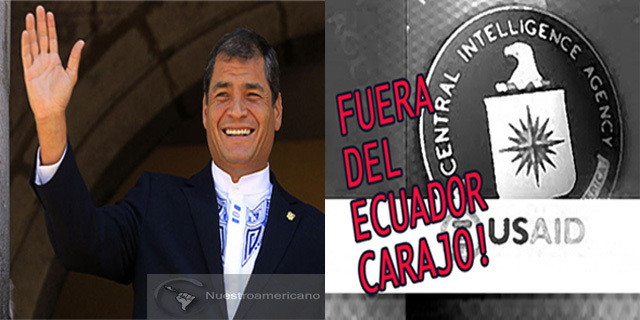 Los cuerpos policiales ecuatorianos han sido favorecidos por la sistemática ayuda financiera y logística norteamericana, entre ellos el Grupo Operaciones Especiales (GOE) de la Policía Nacional Ecuatoriana, el Grupo Intervención y Rescate (GIR) de la Policía Nacional Ecuatoriana, la Unidad Lucha Contra el Crimen organizado (ULCO) de la Policía Nacional Ecuatoriana, el Grupo Especial Móvil Anti-Narcóticos (GEMA) de la Policía Nacional Ecuatoriana y la Unidad Antisecuestros (UNASE) de la Policía Nacional Ecuatoriana. Muchos miembros de estos organismos policiales han establecido fuertes lazos de colaboración, incluidos de pertenencia, con agencias norteamericanas como la CIA, el FBI, la DIA y la DEA durante estos últimos años y se han convertido en fuentes del espionaje estadounidense en Ecuador. A U.S. “alphabet soup” agency-sponsored themed revolution in the Maldives, an island nation in the Indian Ocean comprising twenty-six atolls, stands to plunge the nation, heretofore considered a tropical paradise for tourists, into the same kind of chaos and civil unrest now seen on the streets of Libya, Egypt, and Syria. Maldives is smaller in comparison to the nations of the Middle East where the National Endowment for Democracy (NED), U.S. Agency for International Development (USAID), International Republican Institute (IRI), National Democratic Institute (NDI), and George Soros’s Open Society Institute (OSI) have sponsored themed revolutions that have all resulted in civil unrest and a entrance of extremist Wahhabi Salafists into political power. However, the small size of Maldives provides a much clearer picture of how the aforementioned Central Intelligence Agency (CIA)-sponsored “soft power” aggressors managed to turn paradise into another center of unrest in the Muslim world. In the case of the Maldives, the road to civil strife began in 2005 when USAID- and OSI-sponsored democracy” manipulation groups took root in the country upon the legalization of opposition political parties by the government of President Maumoon Abdul Gayoom. Serving as president for thirty years, Gayoom was seen by the international human rights network of non-governmental organizations as a dictator ripe for removal. The Western-sponsored NGOs settled on Mohamed Nasheed, a Maldivian opposition leader who had lived in exile in Britain – with the support of the British government — and Sri Lanka and who returned to Maldives in 2005, as their favorite candidate for president. In preparation for the first direct presidential election for president in 2008, outside “democracy manipulators” descended on Maldives, a country that had become popular with the Soros network because of global climate change. Maldives, which is threatened by rising sea levels, became a cause célèbre for the carbon tax and carbon cap-and-trade advocates. Nasheed was the 2008 presidential candidate of the Maldivian Democratic Party against President Gayoom’s Dhivehi Rayyithunge Party. In the first round of voting, Gayoom received a little over 40 percent of the vote in the first round to the 24 percent of Nasheed’s and his vice presidential running mate, Mohammed Waheed Hassan. To defeat Gayoom in the second round, Nasheed, obviously with the encouragement of his foreign “democracy” advisers, sought and received the endorsement of four other opposition parties, including the Saudi- and United Arab Emirates-financed Salafist Adhaalath (Justice) Party. Adhaalath is an ideological partner of the Muslim Brotherhoods of Egypt and Syria. In the second round of the election, Nasheed, with the support of the other four opposition presidential candidates, defeated Gayoom 54 percent to 46 percent. Nasheed was immediately embraced by the world’s glitterati community of NGOs and celebrities, including carbon tax-and-trade advocate Bill McKibben of 350.org and the crowd who gathered at the Sundance Film Festival to view a sycophantic film about Nasheed called The Island President. Nasheed was called the “Mandela of the Maldives” by those celebrities whose knowledge of Maldives did not extend beyond the nation’s Wikipedia entry. In October 2009, Nasheed and his Cabinet pulled off a pre-Copenhagen climate change conference publicity stunt by holding the world’s first underwater Cabinet meeting. Nasheed and eleven of his ministers, wearing scuba gear, convened the meeting twenty feet under the surface of the Indian Ocean. 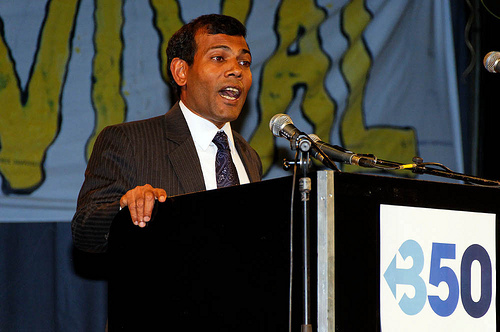 Nasheed was a huge hit among the celebrity contingent at the December 2009 Copenhagen summit. Nasheed was selected by Time magazine at the top of their “Leaders & Visionaries” list of “Heroes of the Environment.” The United Nations awarded Nasheed its “Champions of the Earth” award. Foreign Policy magazine, co-founded by the late Samuel Huntington, a chief ideologist for the neo-conservative pabulum of a “Clash of Civilizations” between the West and Islam, named Nasheed as one of its top global thinkers. Nasheed took on as his close adviser and communications assistant Paul Roberts, a British national. In what alienated his Salafist supporters, Nasheed also opened diplomatic relations with Israel, invited Israeli surgeons to Maldives amid fears they would begin harvesting human organs for Israeli clients, met with Israeli government officials, agreed to allow direct air links between Israel and Maldives, invited Israeli trainers into Maldives to advise Maldivian security forces, and failed to ensure that Maldives voted for Palestine’s full admission to the UN Educational, Scientific, and Cultural Organization (UNESCO) during the organization’s general assembly meeting in Paris on October 31, 2011. Maldives was absent from the vote. Maldivian opposition parties, particularly the Salafist Adhaalath Party which left Nasheed’s coalition, did not buy Nasheed’s government’s weak explanation about the Palestine vote. By the end of 2010, the four other political parties in Nasheed’s Cabinet had left and Nasheed’s government was accused by the opposition of lacking transparency. The trademark yellow neckties and shirts worn by Nasheed and his supporters and the yellow Maldivian Democratic Party flags waved by Nasheed’s supporters were yet another indication that Nasheed’s “revolution” was another “themed revolution” concocted by the Soros/NED network of NGOs and think tanks in Washington, London, and New York. Just as other Soros / NED-installed regimes began to violate the constitutions of their respective nations, including Georgia and Ukraine, Nasheed was no different. On December 10, 2010, the Maldivian Supreme Court ruled that Nasheed’s cabinet ministers could not serve without the approval of parliament. Nasheed responded by declaring the Maldivian courts were controlled by supporters of ex-president Gayoom and on January 16, 2012, Nasheed ordered the military to arrest Abdulla Mohammed, the Chief Justice of the Criminal Court. Counter-protests were organized by Maldives opposition parties and were backed by the police. After the military clashed with the opposition protesters and police, several military members defected and joined the protesters. Faced with the opposition and police/military uprising, Nasheed resigned the presidency on February 7. Later, Nasheed and his British adviser Roberts claimed that Nasheed was ousted in a coup d’etat. The U.S. State Department demanded that Vice President Mohammed Waheed Hassan, who assumed the presidency and opposed the arrest order of the Chief Justice, form a government of national unity with Nasheed’s supporters. Hassan refused and India, which, in the past, has intervened militarily in Maldives to put down attempted coups, remained silent. The Soros/NED global glitterati, including the Soros-funded “Democracy Now” program hosted by Amy Goodman and partly-funded by Soros, featured Roberts on an interview in which Gayoom was described as a thug and who was trying to re-assume power. Of course, the Soros propaganda program made no mention of Nasheed’s repeated violations of the Maldivian constitution. As with the destabilization of Iraq, Egypt, and Libya, the first target for alleged Islamist radicals after the ouster of Nasheed was the destruction of priceless museum artifacts. Unknown men broke into the Chinese-built Maldives National Museum in Male, the capital, and smashed the delicate coral and limestone pre–Islamic Maldivian Buddhist statues on display. The yellow flag of Nasheed’s political party. The rise of Salafists and Muslim Brotherhood adherents in the new Maldivian government parallels what occurred in Egypt, Libya, Syria, and Tunisia after their themed revolutions. The Maldives were destabilized by the West at the same time that the Egyptian government charged 43 CIA-linked NGO personnel, including Americans, Britons, Serbs, and others working for IRI, NDI, and NED, with possessing a secret plan, including maps, to divide Egypt into an Israeli-dominated Sinai state, a Coptic state extending from Alexandria in the north to Asyut in the South, a Berber-dominated Islamic state based in Cairo, and a black African Nubian state in the south. There now may be an attempt by the West to split up Maldives. In 1957, the British established the Gan airbase on the southernmost atoll of Addu and insisted on 100-year base rights on Seenu Atoll. After Maldives Prime Minister and President Ibrahim Nasir adopted a nationalist foreign policy, the British backed a secessionist movement in the southern atolls where the British bases were located that declared the short-lived United Suvadive Republic in 1959. After the collapse of the secessionist republic in 1965, the British bought the southernmost atoll in the Chagos-Laccadive chain of atolls from Mauritius and established the British Indian Ocean Territory. The inhabitants of the Chagos Archipelago island of Diego Garcia were forcibly removed to Mauritius and other Chagos islands and the United States established its strategic military base on the island of Diego Garcia. Maldives never recognized Mauritian claims over the Chagos atolls or the British Indian Ocean Territory. With neo-con interference in Maldives now coming to fruition, secessionist movements in the southern atolls may, once again, gain ground to ensure unfettered U.S. and British control over Diego Garcia and expansion of U.S. and British military facilities to the Addu atoll and, perhaps, further north in the Maldives chain. Source: Strategic Culture Foundation on-line journal www.strategic-culture.org.